Following the mind-blowingly good ‘Generators’ LP comes ‘Occlusions’, Boston-based electronic music agitator Keith Fullerton Whitman’s ‘companion piece’. 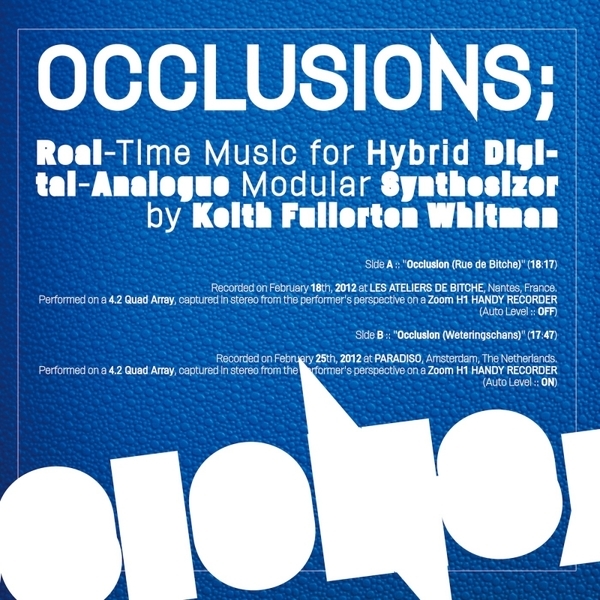 Described as the free jazz to ‘Generators’’ minimalist shakes, ‘Occlusions’ is an appropriate showcase of Keith’s deranged anti-dance-music experiments. At times (and apparently accidentally) a noddable 4/4 kick might shuffle into being, but for the most part the two long live recordings are made up of rapidly evolving scattershot patterns, never staying in the same place long enough for anyone to build up enough confidence to ‘dance’ (substances notwithstanding). Comparisons might be made to Mark Fell’s hallucinatory riffs on the techno idiom, but Keith’s steez is somehow more mischievous, and comes as a timely reminder of how modular synth music can still be done expertly well. There are no hypnotic oscillator drones here, no slowly ascending arpeggios – rather Whitman’s gaze is focused on unpredictable digital splatter and ADD agit rhythmic explosions that defy logic and easy categorization. While ‘Occlusions’ might make its predecessor sound pretty much like James Last, this is a record that anyone with even a cursory interest in electronic music should grab before it disappears into the annals of time, only to be re-discovered when Keith finally gets that Knighthood. Absolutely unmissable!